Premiership Charlton dismissed League Two Rochdale to put their recent run of cup defeats by lower division opponents behind them. The Addicks went ahead through Bryan Hughes after 19 minutes, and defender Jonathan Fortune added a second two minutes before half-time. Grant Holt gave the visitors hope with a clinical finish on 56 minutes. But Hughes headed his second a minute later before Danny Murphy scored with an inswinging free-kick on 64 minutes. 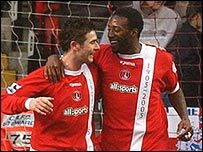 Charlton have been embarrassed by the likes of Oxford, Luton, Walsall and Gillingham in recent seasons. "We afforded Rochdale every respect and had them watched five times. "We knew they would cause us problems and one of those problems was the two boys up front. "They could have scored halfway through the first half and every time they got a set-play they looked dangerous and forced quite a few saves." "In the first half I think we showed them a bit too much respect. "We also conceded a couple of bad goals and we haven't been doing that in the league in recent weeks. "It would have been nice once we got it back to 2-1 to last a little bit longer but they scored another goal so quickly and that killed it." Charlton: Kiely, Young, Fortune (Fish 74), El Karkouri,Hreidarsson, Thomas, Euell (Murphy 45), Holland, Hughes,Johansson (Konchesky 79), Jeffers.Subs Not Used: Andersen, Rommedahl. Goals: Hughes 19, Fortune 44, Hughes 56, Murphy 64. Rochdale: Gilks, Evans, Burgess, Heald, Goodall,Clarke (Warner 76), Bertos, Jones, Cooksey (McGivern 86), Holt,Tait (Atieno 68). Subs Not Used: Edwards, Gallimore.